Ten years ago, Watchmen deconstructed the superhero film. I feel we can safely say it's been re-structed. Yes, there's a comedy out this month, and a documentary, and a couple of horror films and even some breathless teensploitation. But that's all below slots #1, #2, and #3 on this forecast: three superhero films, three comic book adaptations, three additional, unsolicited samples in a genre that sees no sign of closure, with each superhero film longer and better reviewed than the last. Josh Brolin is still Thanos, everstill stuck behind gallons of thick purple makeup (I know it's CGI) and sequestered alone somewhere on a distant dead planet, discovering the full dullness of victory, the completion of his lifelong quest. As we meet him, he is preparing for an eternity of empty junk food and television reruns (well, he's about to be entertained). A year has passed since Thanos' triumph, and so as scheduled the time has come to reverse the entire set of events of the last film, excluding its $678m U.S. box office total, the second biggest of 2018 (behind only another Marvel movie, don't worry, and ahead of yet another superhero film from Disney; not a lot of diversity of subgenres in 2018 there, exactly). Avengers 3 ended with Thanos' evil wave washing over all known life in the universe and eliminating precisely just one half of it, with unclear treatment for rounding errors (I believe Iggy Pop predicted this phenomenon back in the day, when he sang, "If rebels thinking and corruption rules the day, Hot yellow wind should come and blow them all away"). This 50-50 devastation claimed the lives of many members of the universally beloved (...right) staple of Marvel Cinematic super beings, to which people on the internet had all sorts of unusual and wildly inappropriate reactions - no, writer whose name I don't remember, killing off a bunch of superheroes in a manner that we know will be undone in the very next Avengers film does not show how, in fact, they are vulnerable, too (the exact opposite is true), and no, everyone else, "I don't feel so good, Mr. Stark" ranks as one of the absolute most dreadful and disingenuous lines of the decade, given that its speaker even then was scheduled to star in Spider-Man: Far From Home, due July 7, 2019 (that's the eighth solo Spider-Man film in 17 years, by the way. No judgment). Yes, the 'vengers are not the only guilty ones, historically. Star Trek III: The Search for Spock brought Spock back after his tearduct-breaking demise in the second film. But not like this. Not like this. Now, before Avengers 3 (and this is Avengers 4) had come out, I had some suggestions for the Marvel team. For one, as soon as I saw Thanos dramatically and forebodingly previewed in the mid-credits scene of The Avengers (2012), I knew that the only legitimate way that next Avengers film could begin was with Thanos amassing his army, preparing to invade the Earth (again), and then being suddenly attacked and quickly slain by the real villain, who proceeds on to inconvenience our planet. They didn't go with that. I also suggested that the Avengers defeat Thanos in the same manner with which Rita and Zedd finally got rid of the Machine Empire in the final episode of Power Rangers: Zeo (1996). The Avengers should announce their surrender to the mighty Thanos, give him a goodbye gift in a wrapped birthday box, say "catch you on the flip side," and then drive off in their RV while the "gift" in Thanos' hands explodes, blowing him into a million little pieces. Instead we were given the expected: Thanos gathered his Infinity Stones, lobbed one after the other onto that designer stone-holder on his arm, and then fulfilled his near-lifelong wish to exterminate at random half of the known universe, ending the film on a note of false somberiety. It's too bad the movie didn't have a little fun with the 50-50 thing. Was Thanos immune? I would have loved a scene of the Titan himself beginning to vanish, and in absolute acceptance saying, "It's only fair, I suppose." That would have also made the plot of the next Avengers 4 harder to concoct, so I assume it was off the table. Another of my theories - since most of the Avengers who did not "perish" were more established characters who've been around in the movies longer, and since the Avengers really don't care much about the human race and which 50% of them live or die, perhaps the next film could feature some trick that reverses the split: the entire roster of people who made it through Thanos' purge disappear, while the previous 50% return. 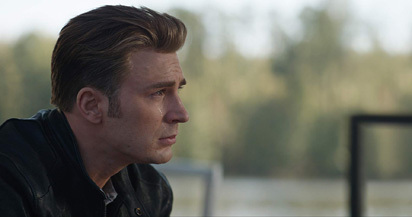 So, no more Iron Man or Captain America 1, who've each had three solo films, but Spider-Man, Scarlet Witch, Black Panther, and Bucky (Captain America 2?) return, ready to star in many more Marvel films forevermore. That may or may not happen, but as Avengers 4 begins now we're up from our weekend bender and must clean up. The Avengers - your Robert Downey, Jrs., your Chris Hemsworths, your animatronic raspy Bradley Coopers - sulk on Earth (or wherever it is they happen to make their home, no judgment), then come together, and fly off into the stars one Friday night to combat Thanos and demand he give half of the known universe back. In this exact, three hour and 58 second-long (each film longer and better reviewed than the last), journey, they will be helped by a few members of the Marvel family unseen in the previous film (Jeremy Renner, Tessa Thompson, Paul Rudd), as well as by Deux Ex Machina (Brie Larson), who just recently has starred in her own wildly successful superhero film, adding another $400m of box office onto the national tab. A few Avengers may die, really, kind of; many more will live; and presumably just about every hero tragically and permanently killed in the last film will be resurrected (although come on... Loki and Gamora are dead. Dead.). Millions of dollars will be made ("a statistic, not a tragedy,"), and the film's status as biggest mullah of the year 2019, in the biggest superhero decade until the next biggest superhero decade, will not perish from this earth. You can call him Captain Marvel. No, I'm not self-indulging in a meta-joke only I could get (this time). Shazam!, the character, was also named Captain Marvel in many previous decades of his existence, and is in this film called simply Shazam! for reasons I don't exactly understand. (as with most of his compatriots in super crime-fighting, Shazam! goes back about 80 years, to 1941. And as with all the rest, he's just as topical and timely today as he was then!). This is normally the point where I would launch into a deluded yet totally factually accurate rant about superhero films, the decline of popular culture, and how these days the birds sing so unhappily. Well, first, that I will already have done in this forecast (at least ten paragraphs' worth above, in the Avengers preview) and will surely do again forthwith (check the Hellboy forecast, below). an orphaned foster kid finds an ancient friendly super-amulet that both ages him up a good 20 years and turns him into a prototypical superhero, inspiring both teenage crime fighting and awkward shenanigans as a fifteen year-old learns to carry a grown man's super-strong frame. "It's Big meets Superman!" And it's the kind of high-concept movie they might have made in the 1990s, when blockbuster cinema didn't really know how to mass-produce and market superhero films to their devotees, and so approached them through a formula that might appeal to the unindoctrinated simple folk who just happened to be shopping by the cinema mall that day (that's a good thing). Of course, I should clarify - the idea 'would' have been kind of fun released on a nice April weekend in 1993, when it would not have been one of 72 superhero films teetering, crawling, creeping their way into theatres, each one longer and better reviewed than the last (I know I keep using that line over and over, but it's so good that I am going to make it stick). OK, Shazam! still looks kind of fun, especially compared to the three hour long, likely 98% Tomato Fresh Avengers sequel ("longer and better reviewed") lumbering slowly towards us as the days count down to April's end. The direction is by David Sandberg (Lights Out) and the cast is mostly novitiate: Asher Angel, of Disney's Andi Mack, is lead kid Billy Batson, Jack Dylan Grazer from It is his best friend (the one they saved all the good lines for), and Zachary Levi, who starred as Chuck on the television series and a Viking spaceman in one or two Thor movies (I have lost count long ago) is the grown Super-Billy, decked out in red tights and ready to brawl. I aptly criticize the Avengers movies for getting too many good reviews, but Shazam! is guilty of this too - 95% on Rotten Tomatoes, the current score, is way too high for something that should be light entertainment. The comic universe is DC, which unlike Marvel sometimes allows a certain untested spontaneity to sneak in, which sometimes leads to failure (there's nothing wrong with that). Aside from the parody elements, I kind of like movies about people transforming into something else (my favourite version of this is still Stunner from the Spider-Man comic books: an overweight woman who plugs in to a virtual reality machine which projects her out as a literal, physical form of a six foot five blonde Amazonian warrior. And by the way, why doesn't the Marvel Cinematic Universe ever do anything fun like that?). As for Billy Batson/Shazam!, I haven't checked, but as a DC character, will he be joining the Justice League? We can keep our fingers crossed. Of course, the trailer isn't totally smart: at one point, high on life and the Shazam! powers, Billy jumps off a tall building, unmolested, shouts "Shazam!," transformers into his super-powered adult alternate, and flies off into safety. This might be an out-of-context trailer bit, but it's kind of irresponsible. As Bill Hicks once said: Why do these a------s who think they can fly never take off from the ground? If it's April... Hellboy debuted on April 2, 2004, and in another case of anniversary-bound scheduling by people who must know something about the relevant alchemy of this release window, another film with the exact same title arrives on its near-anniversary all these many, many, so many, years later. It really could have used a subtitle, I think, and in fact looking at the bigger picture, the 2010s will have produced way too many movies with the exact same titles as other recent films (I mean, two movies named "Halloween" in eleven years? Is the clever example of "2 Fast 2 Furious" not sufficiently inspirational? There are so many numerals available for public usage. Just pick one). The Hellboy of the now stars David Harbour as the horned devil-beast raised from childhood by a kindly scientist (Ian McShane), a demonic being who therefore fights for good even as agents of evil attempt to lead him into a life of petty crime (this time, it's a witch who wants to tempt him into unleashing the apocalypse, thus ending all life on Earth and calling out Thanos as an overthinker). Ron Perlman played the Hell boy before, and the late John Hurt was his mentor, and while I can't speak for the lead role, the re-casting of the professor is certainly understandable. Milla Jovovich is the lead witch, and other veterans of various genre ventures (Daniel Dae Kim, Thomas Haden Church, Stephen Graham) are around to assist them and add some flavour. Guillermo del Toro directed Hellboy one and two, lively and visually supple action fantasies done with the man's trademark sense of craft. Neil Marshall, the director of Hellboy now is no slouch, either, having toiled away on the indie horror scene in the U.K. (Dog Soldiers, The Descent) before getting this Hollywood gig. These Hellboy films were never very big earners - $23m open, $59m total in 2004, $34m open, $75m finish for the 2008 sequel - and Hellboy III or 1A should acclamate to modern-day adjusted numbers appropriately. Released on just, just, about the 30th anniversary of the original Pet Sematary (a mere sixteen days away!). Pet Sematary was a 1983 novel by Stephen King about a mal-intentioned (?) burial ground with a knack for resurrecting dead flesh. It sold enough copies (many millions) to inspire two films, one wildly successful (1989) and the other, a sequel, more in the tradition of B-movie fun (1992). Of course, the sequel is the one I watched more times. The first movie was one in a long bloody chain spawned-off from the work of King, a trail of terror that began with Carrie (1976) and has now proceeded to second-generation remakes of films based on his prose. A Pet Sematary do-over has been rumoured for a while, and now is here, perhaps inspired by the success of It (2017) or perhaps simply because the moment was just right (and when is it not the time for a story about zombie family members coming home for dinner?). Jason Clarke starred as Ted Kennedy in Chappaquiddick this time last year, and returns to the same weekend with a more commercial entertainment that relies on his talents as a serious actor. He is Dr. Louis Creed, father of two and husband of one, who moves into one of the millions of small-town houses across America beset by a local haunting. Nearby there's a pet cemetery, remonikered sematary for unknown but masterful reasons, and an ancient Native American burial ground just past it that brings back whoever or whatever may be buried there (I think they have to be dead first, but this is not certain). And they don't come back nice. But people just keep burying there, and as I recall the deaths in this family begin with the friendly orange tabby cat and proceed on up the rank of familial importance. A quaint local farmer (Fred Gwynne originally, John Lithgow presently) methodically explains the plot and the rules, and as in the original film, will most likely find himself falling under the blade of the resurrected (and though his character died in Pet Sematary 1, South Park brought Gwynne's offensively Maine-accented farmer back for a few episodes, and with any luck may use the character again). As the decades blow harshly past each other, many may have forgotten that that first Pet Sematary was one of the biggest horror films of the 1980s, totaling at $57.5 million and adjusting to $130.1m today; a film that was clearly embraced by adult filmgoers and not just teenagers correctly seeking ghoulish entertainment on a weekend night. Now, the first movie wasn't bad, but my childhood was enhanced by Pet Semtary II (1992), which grossed just $17 million but had a teen protagonist (just post-T2 Edward Furlong) who makes friends with a nice fat child at his school and mourns his mother, who doesn't necessarily stay dead too long. The real showstopper was Clancy Brown, as the friend's stepfather Gus, who was accidentally killed and then rose right up there with R. Lee Ermey in The Texas Chainsaw Massacre (2003) as one of the great monster sheriffs of cinema, cackling with glee to the heavens as he raised hell in King's small Maine town. The original film made so much money that I half-way suspected a new version could be one of the few horror remakes not to outgross its original (The Omen, 2006, and Fright Night, 2011, are two examples of such misfortunates). But that isn't so likely now. Pet Sematary 2019 has received solid, thumbs uppy reviews since its premiere at SXSW a few haunted weeks ago, eclipsing the original, which most critics just hated (it happens; their loss). The remake seems relatively short and to the point, and while the average age of its audience should be a good ten or even twenty years lower than its attendees in 1989, that should be sufficient. Glass and Us have ruled the horror scene this year, and with many more A-level fright films to go, the genre's apeak. Pet Sematary should do quite well enough that we can expect a sequel or even a remake of a sequel. Sheriff Gus must return. Laika studios (Coraline, ParaNorman) is in charge of this month's single CGI film, about big furry mountain creatures imposing their will on the general population (now, now), in the tradition of the departing Smallfoot (September 2018) and its scene-for-scene remake, or so I must assume, Abominable, which really is another bigfoot film scheduled for September 2019. To the layman, Missing Link, Smallfoot, and Abominable appear to be very different names for the same creature. Smallfoot had a modern-day vlogger (James Corden) out on the beasts' trail, while Missing Link voice stars Zoe Saldaña, who joins stereotypical explorers with impeccable upper-class British accents (Hugh Jackman the lead, Stephen Fry the distinguished opposition). They travel into the dark and dreaded outdoors to seek out fearsome and legendary critters, and find not only that their quest has been fulfilled, but that that has happened with a smattering of cheeky comedic relief (few of these CGI animals are created without a knack for intentional punchlines, and the lead beastling here is voiced by the already hirsute Zach Galifiankis, who probably does more than grunt). March's Wonder Park is doing OK for itself with its tale of a girl holding on to her fading childhood dreams, and this tale of grown men doing the same should play about as well. Though the heat this month as always seems to be on live-action comic strips fighting away at the eternal ether. La Llorona is an old ghost from Mexican folklore, a grieving woman who drowned her children (for reasons that made perfect sense to her at the time), and now prowls the countryside, terrorizing the offspring of others and abducting them off into the ether, never to be seen again. Her Spanish alliterative name translates to an English alliterative one: La Llorona is The Weeping Woman. But La Llorona sounds cooler. The film The Curse of La Llorona can be expected to chronicle the character's adventures with reasonable respect to accuracy. Linda Cardellini plays a widowed social worker living in period piece 1970s, whose two children show signs of being easy pickings of La Llorona's snatching exercises (let me again praise the fact that The Conjuring series has revived period piece horror, even if ideally we should be able to go back a bit further than the 1970s some day). Linda would love to pick up a shotgun and blow up the Llorona, but as always with the supernatural in these films, it's more complicated than boom and done. Spiritual assistance is required, including a priest (Tony Amendola) and a character played Patricia Velásquez, who was the Mummy's love interest in those Brendan Fraser films and so has a lot of experience in the field of fending off undead. The film is another from the James Wan shed of ghost horror, and, having directed any number of entries in the Insidious and The Conjuring multiverse, and produced many numbers more, this project is a natural. And while its reception at its SXSW premier was not overtly cheerful, La Llorona has starred in any number of frightful trailers with memorable money shots coming its way. The choice of release date is relatively astute - two weeks after undiluted horror Pet Sematary and a week after semi-horror mixed breed Hellboy, and one week before the real monstrosity, Avengers 4. But one week should be enough. No, really, this is another film in the long line of pictures that mess around with the plausibilities of puberty, as a woman in her 40s who happens to be a technological mogul is cursed or blessed with extreme age reversal, turning into a young teenager who must contend with snipey mean girls and make goo-goo eyes at her elementary school teacher (this joke does not feel inappropriate). By the way, why do old people who look like teenagers always have to go to school? Does sending Edward Cullen the vampire and his creepy cousins to 11th grade high school classes over and over again for a century make any sense? No matter. Regina King, so memorable in the Scary Movie films, plays the soon-to-be-reformed adult, and Marsai Martin, a star of television's Black-ish, is her younger and angrier self. Issa Rae plays the partner for most of Martin's comedic banter, and Tina Gordon, who also co-wrote What Men Want, directs and co-writes here. As the month's only real comedy, Little has gusto, and indeed it was useful to name-check What Men Wants as a rough ballpark for where this film too is probably heading. Not to be confused with the 2015 documentary about William F. Buckley and Gore Vidal (which I highly recommend). And I did! This is from the same feel-good factory, as a black civil rights activist and a three-headed Grand Mecha-Dragon of the Klu Klux Klan bond and forge a deep and unshakeable friendship during that eternally cinematic decade of the 1960s (you know, it's called "reach out and touch someone," and yes, it's a true story. It just had to be). This is well-trod territory for the cast. Star Taraji P. Henson departs from a series of melodramatic action and comedy films (the ending of Acrimony was quite something) and into another 1960s story about civil rights (Hidden Figures is one of her biggest films). And Sam Rockwell, as the Klansman, won an Oscar for playing the vaguely racist deputy in my favourite 2017 film, Three Billboards Outside Ebbing, Missouri, and thus presumably secured this role of a redeemed hater, cut from the same cloth (was his small-town Missouri accent congruous)? Reviews for The Best of Enemies are fair if not overtly or creepily enthusiastic (and not as good as for the 2015 film with the same title). The picture has been advertised ad nauseam on CNN, and the actors have some good cache (Rockwell is in that neat category of actors, like Willem Dafoe, who haven't been nominated for an Oscar over decades of work, and then get two consecutive nominations). The big movies of the month are in desperate need of being counterprogrammed to, and this is a reasonable answer. Now, for my question - why do Klu Klux Klan members always have rank designations that sound like Japanese science fiction villains? In fact, here's a fun exercise: Rockwell's character's real moniker is "Exalted Cyclops." I'm going to list out a bunch of titles, and you have to guess which three are actual Klu Klux Klan designations and which are names of villains from the old, pre-Americanized Japanese version of Power Rangers: Grand Scribe, Fifteen Genii, Wicked Electric Kingdom Nezirejia, Imperial Kloncilium, Elephant Nezire, and Combatant Wumpers. See how you do. After is about a tempestuous love affair and its aftermath, for it is true that every neon night time with no end is followed by creeping yellow morning beating down all locked doors (don't worry, the process is self-repeating). England's Hero Fiennes-Tiffin and Australia's Josephine Langford are the American teenage leads, who meet and copulate and contemplate. And they're lucky to be doing it now, because after a decade or some of dormancy, teen films have experienced a little revival lately, through romances like Love, Simon or Five Feet Apart or critically-acclaimed dramas like The Hate U Give and Mid 90s, which are kind of lower-grossing. Based on a YA book unknown to me and beloved by others, After is more commercial, and might surprise a handful of box office naysayers with a strong opening day or two; there could be a large and excitable swatch of fans of the book, ready to march into theaters and demand this forecast be raised. I await thee. Prepared as contrasting companions to La Llorona on her big weekend, Penguins is the eighth Disneynature film and Breakthrough is a Christian picture about a real-life boy who had no pulse for 45 minutes and returns to tell us about it (Shazam!). It's hard to pinpoint Disneynature box office quite down to the dollar these days, but suffice it to say these Earth day releases keep coming on the same weekend about each year and likely will as long as there's an Earth to come to (and also that the $32m total of the original Earth day film, titled, indeed, Earth, 2009, won't be matched). Predicting Breakthrough isn't super easy, either, but there's a likeable lead (Chrissy Metz, of This is Us) and a game supporting cast of established actors (Dennis Haysbert, Josh Lucas), factors that don't much necessarily influence the target audience, either, but take up at least a sentence of forecasting space. Which film will triumph over the other? Don't bet on the guys in the penguin suits.